Hutchinson Island and the nearby the communities of Jensen Beach, Fort Pierce and Stuart, Florida, offer a wide variety of accommodations for any budget. From ocean front resorts to quaint bed and breakfast inns, there is something for everyone! Begin each morning to the sights and sounds of peaceful, tropical Hutchinson Island and enjoy the beautiful nature, friendly people, and the laid-back and relaxing atmosphere. Located on Hutchinson Island, Fort Pierce, Florida, Beachfront Inn oceanfront beach hotel, offers rooms with balconies showcasing the stunning views of the Atlantic Ocean and Fort Pierce Inlet. Awake to the beautiful sunrise over the ocean as you watch the boat traffic come in and out of the inlet. The onsite restaurant and bar, The Inlet, features live music of all genres playing well into the night. Accommodations; 25 rooms oceanfront & inlet views with microwave, refrigerator, and coffee maker. Pets are allowed on request. 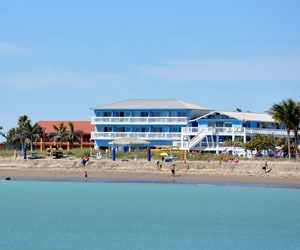 Hotel Amenities; On site restaurant and bar, The Inlet, features live music. On-site fire pits, beach, free WiFi, free parking. 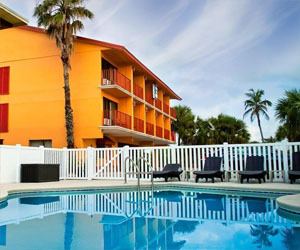 Located on Hutchinson Island, Jensen Beach, Courtyard Hutchinson Island Oceanside beachfront hotel offers gorgeous rooms with panoramic views of the Atlantic Ocean and Indian River Lagoon. Accommodations; 8 floors, 104 rooms, 6 suites, spacious rooms with direct ocean views and river views, lush bedding, flat screen TVs, marble bathrooms, kitchenettes and complimentary wireless internet access. Hotel Amenities; freshwater pool and hot tub complete with a tropical waterfall, Latitudes Outdoor Tiki Bar and Grille restaurant, bar & poolside drinks, fitness center, laundry on-site, business center with meeting spaces for business groups, events & meetings, social events & beach weddings. 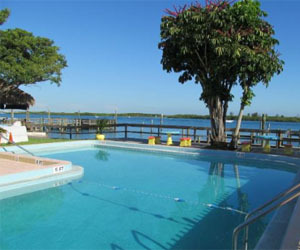 Located on Hutchinson Island, Dockside Inn & Resort hotel beachfront resort offers waterfront lodging with stunning views of the Atlantic Ocean, St Lucie Inlet and Indian River Lagoon. 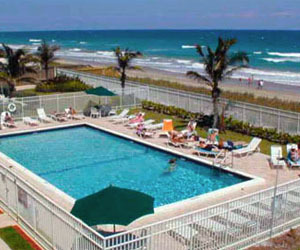 Accommodations; 2 floors, 36 units with 5 types of accommodations, meeting room with private veranda overlooking the Fort Pierce Inlet, 5 fishing piers, 34 boat slips, heated pool and whirlpool, 5/8 Mile from the Atlantic Ocean, pet friendly, on-site restaurant On the Edge Bar & Grill, laundry rooms, Dockmaster, bait, tackle, ice and supplies, covered picnic areas with barbeque grills. Amenities; ocean and inlet views, complimentary continental breakfast baskets provided in room, work desks, free wireless internet, TVs, wet bar, microwave, and refrigerators in all rooms, complimentary in room coffee. 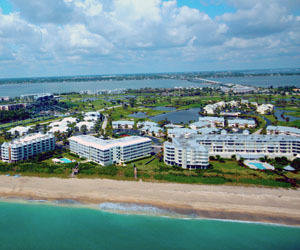 Hutchinson Island Marriott Beach Resort & Marina is a vast 200 acre property filled with exceptional hotel amenities, oversized direct beachfront panoramic ocean view rooms and suites as wells as golf course view rooms and suites with balconies. 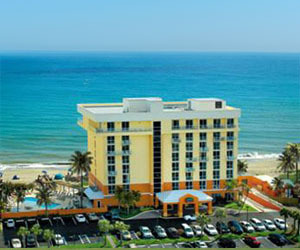 Accommodations; Guest rooms are located both in the main hotel and the Sandpiper Tower right on the beach. All rooms and suites feature private balconies or patios, with ocean or resort views, many suites offer full kitchens with stovetop, microwave, wet bar, mini-refrigerator, dishwasher, silverware, pots, pans, and serving dishes, bathrooms include Bath & Body Works amenities, shower/tub combination, double vanities, hair dryer, robe, desk, room service, iron and ironing board, coffee maker and tea service, high speed wireless internet access, flat screen TV with cable, living and sitting area and dining area. Resort Amenities; 200 acre property, 224 spacious guest rooms and 50 suites, private 18 hole golf course at The Ocean Club with Aqua Driving Range, 13 tennis courts, 3 heated pools and two whirlpools, charter boat fishing and boat rentals, jet skis, kayak and paddle boarding rentals, onsite dining at the Baha Grille, Ocean Club Café, Sandpiper Tiki Bar, and Latitudes Tiki Bar, fitness center, laundry and dry cleaning services, complimentary beach chairs, umbrellas and towels, Business Center, Meeting & Event Center with 21 meeting rooms, 26,000 sq ft of total meeting space, Plantation Ballroom with a capacity of 510 Maximum, 17 breakout meeting rooms, exhibition space, Beach Weddings, wedding planner, catering services, group rates. Marina Amenities; Daily, monthly, seasonal and annual rates, fueling station, water hook-ups, electricity, cable television, WiFi Internet access, house telephone, daily newspaper, dockhands available, amenities also include full use of all resort facilities. Amenities; private inlet beach, hot breakfast bar, pool, hot tub, exercise room, gift shop, fishing pier and boat dock, fishing rod rentals, and easy access to surrounding beaches and waterways. Also known as Beach Hide-A-Way at Island Beach Resort and All Suites Island Beach Resort. This Hutchinson Island beach resort is located directly on the ocean offering beachfront rooms with stunning views of the Atlantic Ocean and waterfront views of the Indian River Lagoon. With an on-site restaurant and beach bar, you'll enjoy sipping on umbrella drinks and their famous rum buckets while basking in the sun on the beach. Amenities: Heated oceanfront pool, 2 sun decks, 2 outdoor BBQ grilling areas, Shuckers a popular on-site oceanfront tiki bar and restaurant, live music and entertainment, direct beach access, water sports rentals, complimentary wireless internet access, catering facilities and services, special holiday events and social gatherings, gift shop, corporate events, banquets rooms and beach weddings. Accommodations: Direct ocean views, TV's with DVD players, fully furnished kitchen with blenders, toasters, and coffee makers, high-speed wireless internet access, 1 and 2 bedroom suites, pull out sofa sleepers in most suites. Located in Fort Pierce on Hutchinson Island, the Royal Inn Beach sits directly across the street from the beaches of the Atlantic Ocean. Conveniently located within walking distance of the Fort Pierce Inlet Jetty Park and it's 200-yard long Jetty as well as numerous restaurants, bars and popular entertainment spots including the famous Archie's Seabreeze, Jetty Lounge, Hurricane Wings & Grill, Mangrove Matties and The Inlet. Amenities; Hotel with ocean views and sunset views, private balconies, pool and sundeck, BBQ grill, beach exit shower facilities, pool chaises and cabanas, business center and 24-hour guest laundry, a 700 square foot 2 bedroom apartment suite complete with living area with dining table and sofa sleeper and a full-size kitchen with all cookware, dishware and utensils for those considering longer stays. Accommodations; ocean views balcony rooms, 32-inch flat panel HD TVs with premium satellite television, 5 Channels of HBO, complimentary high speed WIFI, complimentary breakfast,, coffeemakers, microwave oven, refrigerator with freezer, bedside USB and outlet plugs, ceiling fans & digital air conditioning in every room, granite bathroom vanities and bar sinks in every room. 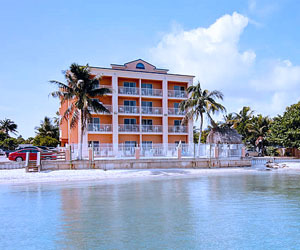 This Key West style Stuart, Florida Bed and Breakfast Inn is nestled in the heart of The River Front Village. Historic downtown Stuart shops, restaurants and entertainment are within walking distance. 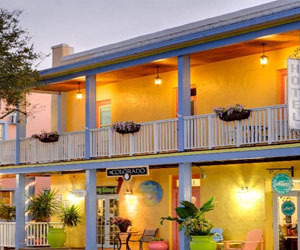 This Stuart, Florida B&B offers four rooms with cable TV and air conditioning. You'll enjoy the property's waterfront views of Shepard's Park and Frazier Creek Beaches. Relax in the Jacuzzi, hammock, lounge on their wrap-around porch or use their beach gear for your visit to nearby Hutchinson Island. Bicycle and a cooler supplied free of charge. 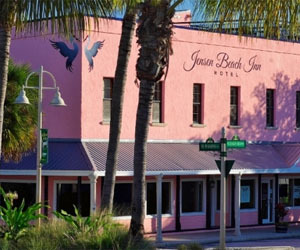 Located in the heart of historical downtown Jensen Beach, The Jensen Beach Inn has recently renovated its seven room inn with charming tropical decor to include private bathrooms, luxurious linens, central air, free Wi-Fi and a large flat screen TVs. Continental breakfast is included. You'll enjoy the gentle Atlantic coastal breezes, warm sunny skies and the quaint, laid back casual atmosphere of the historic waterfront downtown Jensen Beach. There is plenty to see in do within walking distance with pedestrian friendly sidewalks, award winning restaurants and art galleries. 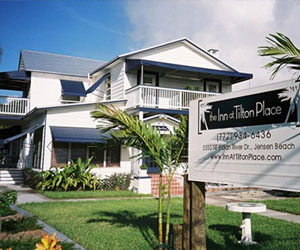 Located just across the street from the Indian River in Historic waterfront community of Jensen Beach, the Inn at Tilton Place also has a rich history of its own. The 110 year old home has been restored and tastefully decorated with in-room private bath in six of the eight rooms. The Inn a Tilton Place offers a 3 course breakfast, free Wi-Fi onsite, pet friendly rooms, complimentary wine in the evening, events and event planning including weddings. Many great restaurants, art galleries and specialty shops are all within walking distance from the Inn. Located on North Hutchinson Island, The Mellon Patch Inn sits just a few hundreds yards from one of the most beautiful beaches on the Treasure Coast. This cottage-style Inn is reminiscent of old Key West with quaint rooms that that offer the sophisticated accommodations of a small luxury inn. The Mellon Patch Inn has blossomed into a premier Bed & Breakfast on beautiful North Hutchinson Island. Accommodations includes 5 rooms with king size beds, double beds and twin bed, private bath with shower and tub, wireless internet, event catering, full-handicapped/wheelchair access, ocean and riverfront access, non-smoking rooms, pier on site, private porch, room with scenic views, balcony, large patio, banquet facilities, full Breakfast, cable TV, air-conditioning, tennis courts nearby and beach access. Located on Colorado Avenue in the heart of Historic Downtown Stuart, FL, only a few miles from the sandy beaches of Hutchinson Island and a couple of hundred feet from the St. Lucie River, the Old Colorado Inn offers deluxe studios, spacious and luxurious suites, a charming cottage, and a spacious historic guest house nestled in a casual tropical setting. While not officially a bed-and-breakfast, the Old Colorado Inn provides guests with Natalie’s Orchid Island orange juice, pastries and bagels from Bagel Brothers of New York and a newspaper each morning. A short walk from waterfront fine dining, shopping and entertainment at the Historic Lyric Theater. The popular Acapulco Joe’s Beach Grill, 18 Seminole Street, Noodle World Thai and Sushi restaurant are located on the Hotel premises.